From the Experts at The GPS Store, Inc.
With so many new marine radar technologies being introduced over recent months, it can actually be intimidating for recreational boaters to decipher what it all means. Furuno NXT — The new DRS4D-NTX is Furuno’s “next” generation radar, yet, with its compact 24” radome antenna, it’s sized right for even smaller center consoles and pilothouse boats. Designed to interface with the company’s popular NavNet TZ Touch and TZ Touch2 multifunction devices, NXT radar introduces what Furuno calls Target Analyzer. In a nutshell, this feature makes it easier for boaters — even ones with limited experience using radar — to detect, track and avoid dangerous targets that are moving towards their vessel. Based on Doppler technology, Target Analyzer automatically changes the color of targets based on if they are moving towards you and at what speed. Targets such as land, stationary boats/buoys, or slow-approaching vessels (>3 knots) show up in green. Targets turn red if they are approaching your vessel at a speed of 3 knots or more. The feature factors in your vessel’s own speed, and also works if you are following another vessel. Given how many boaters use their radars only occasionally, when they find themselves in darkness, fog, bad weather, etc., this feature (which can be turned off) alone can boost the navigator’s confidence level. 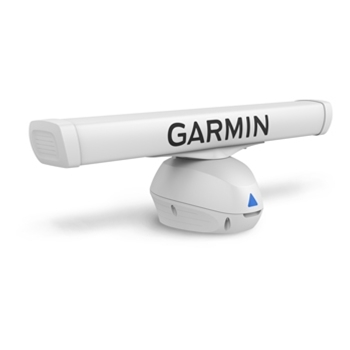 Garmin GMR Fantom — Garmin’s Fantom Pulse Compression Doppler Radar series comes with 4-foot or 6-foot open array antennas and 40W of power, making it an option for tournament fishing rigs, cruisers and other larger boats. Among the key new features is MotionScope, which the company says lets mariners see targets moving instantaneously on the display and uses the Doppler effect to determine relative motion of the target. Whether targets are moving towards or away from the radar, Fantom provides instant detection and highlights these targets on the radar display. Auto Bird Gain is another feature serious offshore anglers will appreciate, designed to tune the radar to help users locate flocks of birds near the water’s surface, a sure sign that predatory pelagic gamefish are feeding. The Fantom series is compatible with Garmin’s popular GPSMAP 7400/7600 series, GPSMAP 8000/8200 series and new GPSMAP 8400/8600 series MFDs. 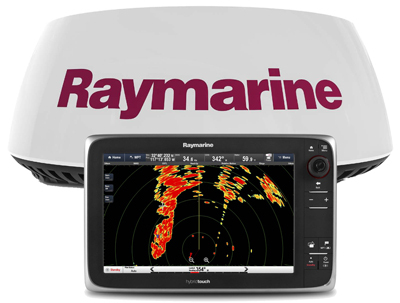 Raymarine Quantum Wireless CHIRP Radar — One big thing that sets this new radar apart is the wireless WI-FI connection between the radome antenna and compatible displays. With this unique feature and a small power cable, Raymarine delivers a radar that’s lightweight (about 12 pounds) and easy to install in tight spaces. It also uses very little power (17W transmit/7W standby). This makes is a good option for boats like center consoles and sailboats with limited battery capacity, as well as larger vessels. CHIRP pulse compression technology ensures that more energy reaches long-range targets, yet is also delivers excellent short-range target detection, a hallmark of solid-state radars. Minimum target range is 18 feet, while the maximum range is 24 nautical miles. A feature called ATX (Advanced Target Separation) identifies small, weak targets (think kayakers or SUP riders) even when close to strong returns like jetties and seawalls. A bolt pattern that matches previous generation Raymarine radars makes it easy to upgrade this new radar to existing systems (in addition to wireless WI-FI, it can be set up using wired Ethernet). Wireless integration is possible with any Raymarine Lighthouse II-powered MFD. Simrad Halo Radar — This new Simrad radar technology combines the short-range target clarity of its popular 3G/4G broadband radar with the benefits of traditional pulse radar’s long-range performance (reaching all the way up to 72 nautical miles). Offered in 3-, 4- and 6-foot open array antennas and designed exclusively for Simrad NSS evo2 and NSO evo2 MFDs, these systems are appropriate for vessels ranging from larger center consoles sportfishers to trawlers and cruisers. 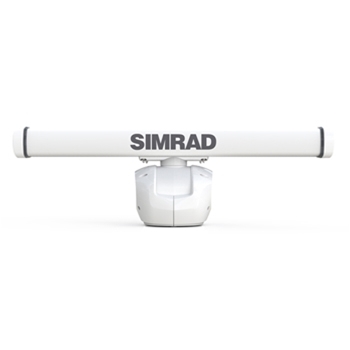 Simrad’s Beam Sharpening and Target Separation Control, the company says, gives each model resolution one would expect from a larger-sized antenna. Solid-state technology means minimal warm up time and low electromagnetic/radiation emissions for safe operation. A choice of five auto modes — Harbor, Offshore, Weather, Bird and Custom — helps navigators configure the radar to suit their surroundings and needs. Bird mode is an important feature for serious offshore anglers. Years ago, Simrad 3G/4G broadband radars upped the ante for close-range target definition, now the open-array Halo systems combines this capability with traditional long-range performance.